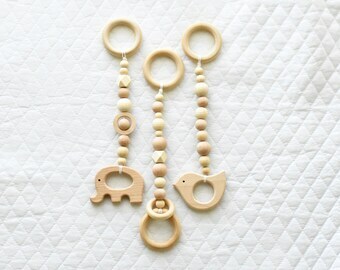 - Perfect for baby showers, photoshoot prop, or nursery decor. Smooth, sanded pine wood. Ships unassembled with wood legs, hanging dowel, two Phillips head screws two cotton ropes, and a small Phillips head screw driver. No tools needed for assembly. 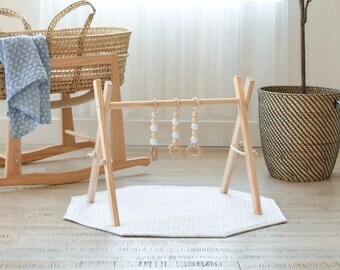 Select from color options including natural wood, or white or gray paint. 24 inches high, 24 inches long, 12 inches wide when open and standing. 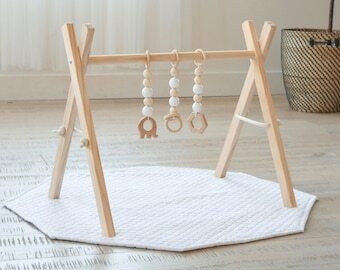 The wood hanging bar stands approximately 16 inches off the ground when open and standing. The bar is 1 inch in diameter. 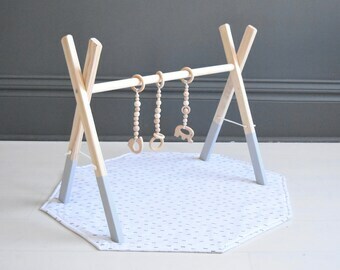 Custom made to fit Poppyseed Play Baby Gyms with beech wood beads and shapes. 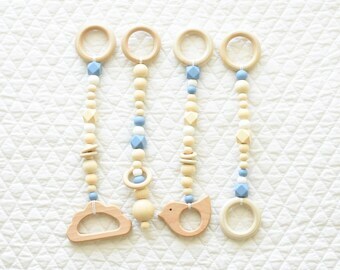 Wood shapes at the bottom of the toys are an elephant, ring, and bird. We do our best to reinforce and check every single toy and gym for defects, but please let me know if you find any problems and I will be happy to replace it for free. 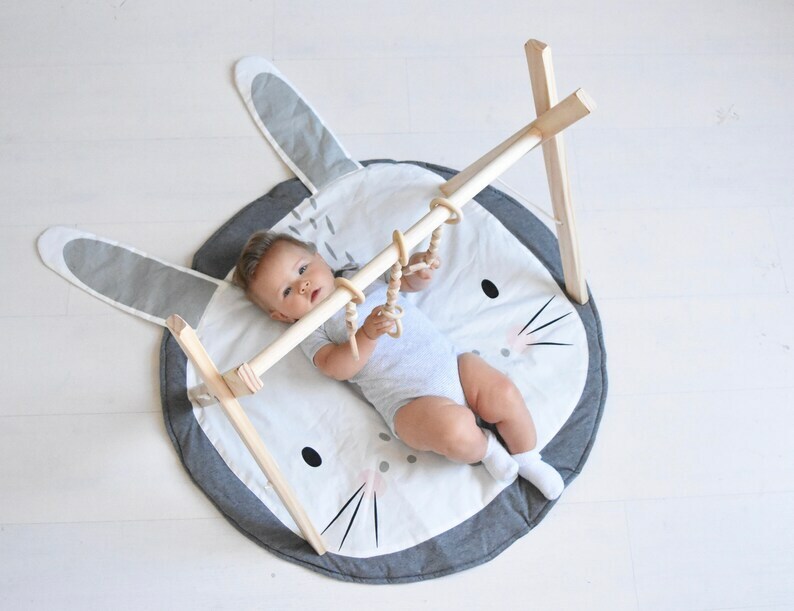 Simply slide the wood toy rings over the hanging bar of your wood gym before attaching the side legs, and you'll be ready to play in seconds. 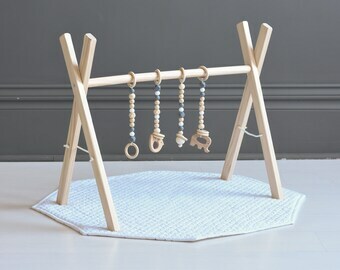 Hanging toys are for use as a sensory toy, not as a teether. 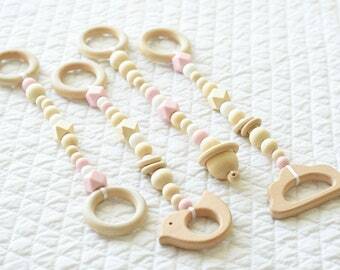 Small pieces may be a choking hazard for infants and young children. Do not leave children unattended while under or around the gym or hanging toys. Love it!! Can’t wait for our little girl to play! 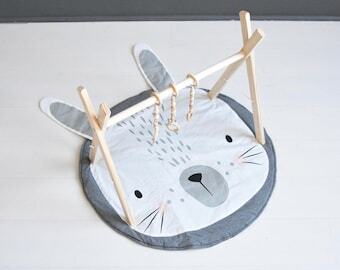 Lovely design, and easy to put together! I like that I can add my own toys and swap them out to keep my baby’s attention. We love helping pick custom colors for wood gyms! Just send me a message and we can get started on your custom order. However, I don't currently accept any customization requests for hanging toys. All of our toys are pre-made and ready to ship as soon as you order! We don't currently offer gift wrapping, however every single gym ships in a beautiful Poppyseed Play canvas bag. We aren't currently accepting wholesale orders. If a package is returned to us due to an incorrect shipping address provided by a customer, the customer will be responsible for the return shipping cost as well as the re-delivery cost. I am not responsible for packages delivered incorrectly or lost due to incorrect shipping information provided by a customer.